When I set out to write MISSING, it was a basic concept for a single story – that of a soldier missing in action and how his wife would move on. Little did I know how it would blossom into not one story, but three, spanning different generations, and subsequently, into a second book. War and the effect of war on human beings is a tough subject no matter how you approach it. I thought long and hard on how to write each story, how to best represent the sacrifices of so many, and made my goal for you, the reader, to identify with the characters and in some small way feel like you were there. I learned a lot through my research; I watched difficult films and had difficult conversations with those who served. I stood at the feet of the Vietnam Memorial Traveling Wall and cried when my father said, “There but for the grace of God am I.” And it has become my goal to never forget. Yet as much as there were heartbreaking moments, there were joys as well. To represent God’s love on any level – the enduring love of a husband and wife, the love of a father and son, the love of a man for a woman – is a wonderful thing. I am so excited about the release of FOUND. It represents the culmination of a life-long dream and a stepping stone to more books and more writing. In celebration of this upcoming holiday season, I’m having a two book giveaway. To receive a print copy of both MISSING and FOUND, leave a comment below with your email address, and I will pick one random winner. When Molly Sanders answered the phone, she wasn’t prepared for the person on the other end – her husband’s past had come back to haunt them. Yet a tragic accident and the unplanned visit of a boy from France will bring them something unexpected. Forgiveness. Stephen and Adele Sanders’ never quite overcame the memory of John Davis. When personal tragedy threatens to tear them apart, it will take the divine move of God in a stranger’s life to bring healing. Tad never fit into society until Beth Sanders loved him. Yet despite their wedded bliss, all is not as it seems. Looking back, Tad tells the tale of the mysterious threats that almost destroyed them, and of love that spans time. The Vietnamese marketplace teemed with life. Pressed in on every side, the young American girl sailed down the aisles wide-eyed, soaking in the incredible sights and sounds. She was a long way from home, yet found kindness in the friendly Vietnamese faces smiling at every turn. The sea of humanity sucked her in, and she surged forward. The market held an impressive array of items: plastic baskets filled with fresh fruit and vegetables, tables of seafood – fish, crabs, and eels – racks of colorful clothing, even crates of live animals. A basket of ducklings peeped vigorously as she passed. Twisting and turning amongst the crowd, her gaze scanned the spectacle, and the crowd propelled her farther. Her only break from movement came when the snake-like horde of people deposited her in a nook underneath a blue canopy. Here, she sucked in her breath and exhaled in a slow stream. She brushed her hair away from the sides of her face and adjusted the blue cloth ribbon of a conical hat she’d purchased. An elderly Vietnamese woman extended her hand, a spiked fruit in her palm. “For me?” the girl asked. And the old woman smiled widely and nodded. Lifting the fruit in her hand, the girl admired it, wondering as she had so many times this day what it was and how it tasted. She reached into her pocket for a few coins, and a flash of light from around the old woman’s neck blinded her. Curious, she leaned forward. What was it? The flash repeated, casting two disc shapes on the ceiling and walls of the tattered canopy. The girl’s eyes, already large from the day’s encounters, took on a completely new size. “Where did you get that?” she asked, and unthinking, she reached out for it. But the old woman bowed her head, burying the necklace beneath her blouse. That won’t do. I must see it. “No, no. Please,” the girl begged. Her hand grasped the old woman’s shoulder, and at her touch, the woman hesitated. “Please, I’ll … I’ll buy it.” She scrambled her fingers into her fanny pack, plucking out several crumpled bills. “Here, take all of it,” she said. At the sight of so much, the old woman’s face broke into a grin, yet she didn’t act. The old woman stared at the money, her heart in her throat. The necklace meant so much to her for it reminded her of her children, though they were dead many years ago. However, the amount of money in the girl’s fist was a lot, and it would help she and her sister much. They only had each other. Her hand went to her throat, and she clenched the discs tightly. She would, after all, always have her memories of them. She shut her eyes and heard their laughter again, bubbling in the air. She counted their sweet faces, smiling back at her. The young American girl’s voice broke into her thoughts. Peeling open her aged fingers, the girl pressed the money into her palm, and instinctively the old woman’s fist curled around it. She sighed. Perhaps it was time. If the necklace meant this much to her, then so be it. Looping the metal chain over her head, for a second she stared at it and her memories rushed past. Then, crumpling them into a heap, she placed them into the girl’s outstretched fingers. Your two novels both sound very interesting. I would love to win one or both of them. Sincerely yours in Jesus, Marriott Cole PS You are a good writer too! Missing and Found sound like powerful stories that I must read. I would love to win a copy of them. Thank you so much for this giveaway. I would love to win both of these books. I would also like to buy these for my church library. Great giveaway thank you. Enjoy your Thanksgiving. Sounds great!! I would love to win!! Thanks for sharing this post. 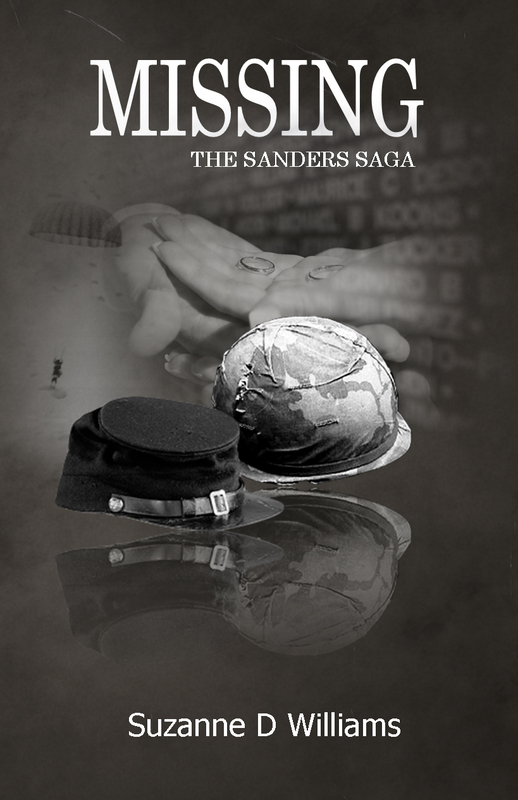 I was intrigued by the story because my grandma’s maiden name was Sanders. Best wishes with your books. My daughter is a United States Sailor and I have not read any of your books as of yet… I would so love love to read this series it sounds fantastic… you had me from the first sentence!!! Have a blessed day and please enter me …. This excerpt really touched my heart – would love to read it!!! Hope you pick me randomly….I would be glad to receive the gift!!! 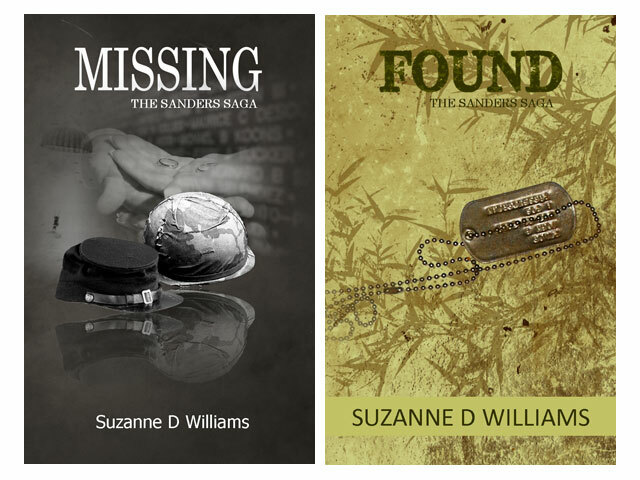 Congratulations on the release of Found, Suzanne!